O Holy Night O holy night, The stars are brightly shining It is the night Of the dear Savior's birth. Long lay the world In sin and error pining, Till. 3 O Holy Night Fall on your knees, Oh, hear the angel voices! O night divine, O night When Christ was born! 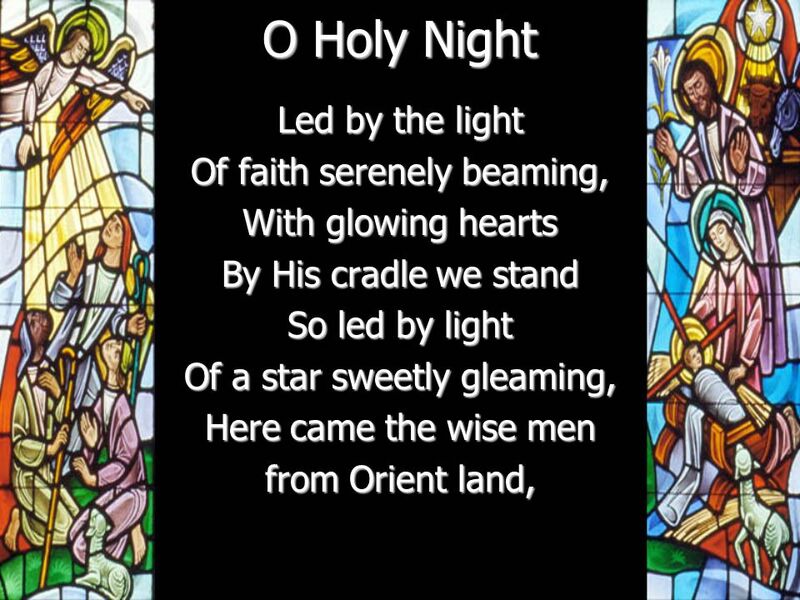 O night, O holy night, O night divine! 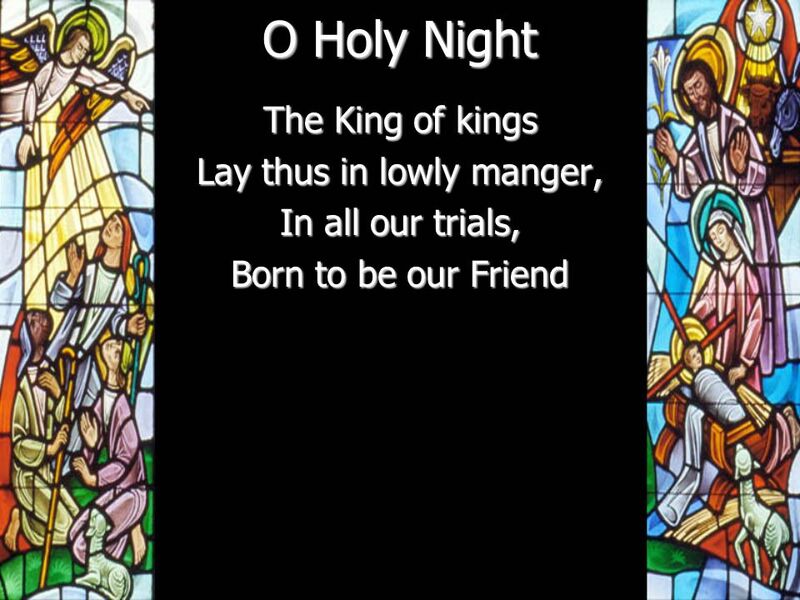 Download ppt "O Holy Night O holy night, The stars are brightly shining It is the night Of the dear Savior's birth. Long lay the world In sin and error pining, Till." O Holy Night. 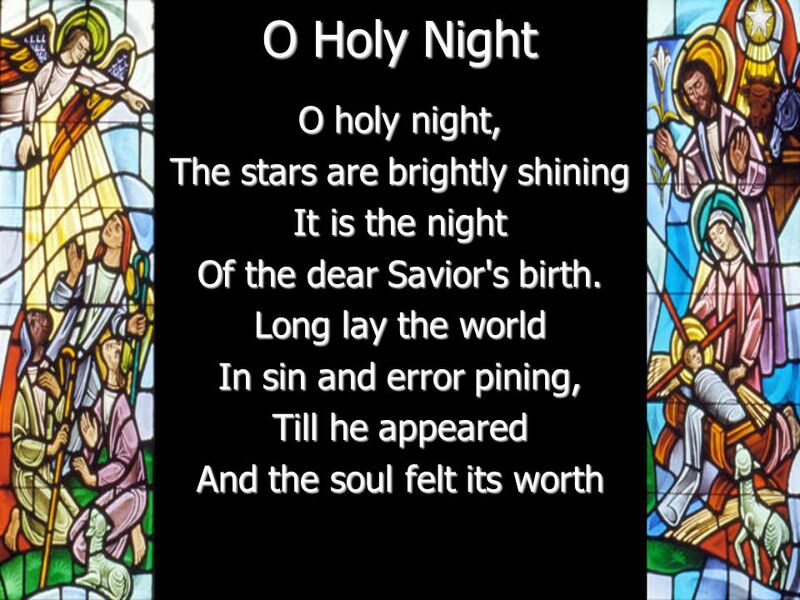 O holy night The stars are brightly shining It is the night Of the dear Saviors birth. O Holy Night. Oh, holy night the stars are brightly shining It is the night of our dear Savior's birth! O Holy Night: Verse 1. O Holy Night O holy night, the stars are brightly shining; It is the night of the dear Savior’s birth! Long lay the world in sin and error pining, Till. 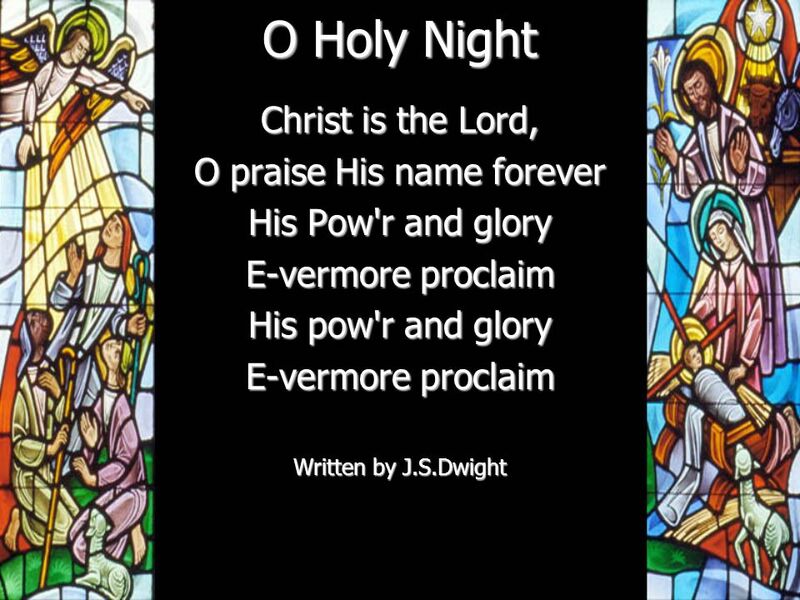 O Holy Night Lyrics Christmas Carol Lyrics O Holy Night! The stars are brightly shining, It is the night of the dear Saviour's birth. Long lay the world. #125 Midnight Sleeping Bethlehem Midnight sleeping Bethlehem, Bright Thy stars in solemn night Sudden glory floods thy hillside, Startled Shepherds wake. “Angels We Have Heard On High” Angels we have heard on high Sweetly singing o'er the plains And the mountains in reply Echoing their joyous strains Gloria. LoV Caroling, Caroling Caroling, Caroling, now we go; Christmas bells are ringing! Caroling, Caroling, thru the snow; Christmas bells are ringing! Joyous. Come Let Us Adore Him FHE Resource Book Lesson 37. O Holy night, the stars are brightly shining It is the night of the dear Saviors Birth Long lay the world in sin and error pining Till He appeared and. O Come, O Come, Emmanuel O come, O come, Emmanuel, and ransom captive Israel, That mourns in lonely exile here,. Until the Son of God appear. GOD OF ALL SPLENDOR. God of all splendor, wonder and might. Awesome creator, author of life. Master and Savior, wholly divine. God of all splendor, wonder. Angels We have Heard on High Angels we have heard on high Sweetly singing o’er the plains, And the mountains in reply Echoing their joyous strains. Let everything that Let everything that has breath Praise the Lord.